Trump Avoids Swing Districts As He Campaigns Ahead Of 2018 Midterms The president goes to places where he can make the biggest impact for Republicans, which has largely meant avoiding suburban swing districts and focusing his attention on places he won in 2016. President Trump arrives at a campaign rally in Mesa, Ariz., Friday. He has been holding events around the nation in the final weeks of the midterm campaign, but most of his stops are in states that he won in 2016. 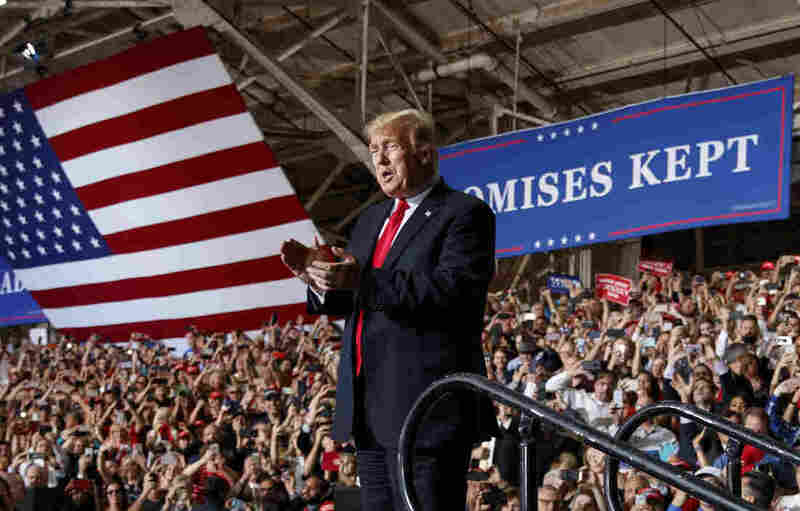 As President Trump came to the big finish at a recent rally, his supporters crowded into the Kansas Expocentre shouted along with his 2016 catchphrase. Voices bounced off the walls saying "we will make America great again" as the Rolling Stones swelled through the sound system. But, the Kansas congressman facing an even tougher race, Republican Rep. Kevin Yoder, whose district is rated "leans Democratic," wasn't there. His campaign cited a scheduling conflict for missing the rally. His district in the Kansas City area was only an hour away from the rally by car, but Republican strategists say his race may already be lost due to anti-Trump sentiment in the city and neighboring suburbs and a backlash against Republicans statewide. "He doesn't go to places that are sure wins. He doesn't go to places that are sure losses," said White House political director Bill Stepien in an interview with NPR. "This is a point in time in the campaign where there isn't any time for waste or to send the president to a place that in which the outcome is already decided. So he's in places that are competitive, that are up for grabs and in which he can make a real difference." On Monday, Trump is set to hold a rally with Texas Sen. Ted Cruz in Houston, a Democratic stronghold with a handful of competitive districts surrounding it. A source familiar with White House political strategy tells NPR Houston was chosen because that's where Cruz's team determined Trump would be most helpful and because there are Republican congressional candidates in the area who could use a boost too. But, the Houston Chronicle reports Rep. John Culberson, whose district is near the rally, won't be attending. Instead, he'll be attending a previously scheduled neighborhood meeting related to flood control. His district went to Hillary Clinton in 2016, and Cook rates it a toss-up. "If he were to come to a suburban swing district, most vulnerable Republicans would likely be busy washing their hair," Democratic strategist Jesse Ferguson said of the president. Trump's goal is to campaign more aggressively ahead of the midterm elections this fall than any of his recent predecessors. He is concentrating his efforts in areas where in 2016 he outperformed previous Republican candidates, like Erie, Pa., where he campaigned last week. Stepien explains these areas "are bastions of Trump-ism, that candidly are more Trump than Republican." As for the states he visits, Trump's travel schedule consistently favors those where Republicans are dominant as well as battleground states that will be key to deciding the 2020 presidential election. There are competitive house and senate races in Democrat-heavy states like New York, New Jersey and California but Trump isn't staging big rallies there. A Republican involved in Senate races around the country suggested to NPR that Trump's travel schedule is at least partially influenced by 2020 electoral considerations. He is campaigning for a mix of House, Senate and gubernatorial candidates, who as Stepien puts it, "are echoing the president's message and the policy successes of these last two years — more jobs; better paying jobs; safer, more secure borders — most boldly, most proudly." In other words, those who are embracing Trump are much more likely to be embraced by him and are more likely to benefit from a presidential campaign stop anyway. Boisterous rallies are a big part of the Trump experience. But the people who attend those rallies aren't necessarily Republicans or regular midterm voters. Stepien said as many as 30 percent of those in attendance at these rallies either voted for the first time in 2016 or typically vote only in presidential years, which is why Trump says that while he isn't on the ballot, his policies are. It is a somewhat unusual strategy for a president with an underwater approval rating headed into the first midterm election of his presidency. Trump often says he intends to buck history, and if he's going to do it, it will involve boosting turnout for Republicans. Stepien said Trump's rallies "are real opportunities in front of big crowds" to introduce Trump fans to Republican candidates who are on the ballot in November. NPR's Don Gonyea, who has reported from several Trump rallies this year, often finds attendees who have no idea who their congressional representative is. So, such introductions are apparently needed. Republican pollster Robert Blizzard, who worked on a congressional special election in Ohio in August, where Trump held a rally on the eve of voting, said he saw the president boost enthusiasm in the Republican base. And in the places Trump is going, Blizzard doesn't see much risk of it backfiring. "I mean, Democratic voters on a 1-10 scale are already at like a 13," he said. "Getting the president into some of those places to kind of fire up the troops and get them excited can only be a benefit," Blizzard said. "At this point in time, Republicans will get all the negatives associated the president; we sure as heck might want to go after the positives as well." Does the president help more than he hurts? It's a debate waged every midterm. Ferguson, the Democratic strategist, is betting it hurts, at least in districts where Republican incumbents face Trump-generated headwinds. "When he goes to a district, he is a reminder that Republicans in Congress have become his yes men," Ferguson said. "And voters want a check and a balance, not a servant." Trump said this week, though, if Republicans lose the House, then he doesn't bear responsibility because he's been campaigning so hard for them.